Towards a lawsuit against AU? President Pierre Nkurunziza announced prosecutions against the African Union in compensation for Burundian troops in Somalia. “Burundians have got a gift, that of engaging in legal proceedings and not letting go of the case”, said President Pierre Nkurunziza on Tuesday 20 December. It was on the occasion of the best wishes exchange ceremony organized by the defense and security forces as well as the intelligence service. For the Burundian president, the African Union has not respected the clauses of the memorandum signed with Burundi, concerning the payment of the salaries of the Burundian troops engaged in peace keeping mission in Somalia, Amisom. “The European Union and the United Nations sometimes, have been negatively involved in this affair,” says Pierre Nkurunziza. Faced with these constraints of a nature to undermine the morale of the troops, the Supreme Commander reassures: “Burundians will fight until they get their rights. According to him, they will even claim damages. “Burundian people cannot be stolen what belongs to them legally “. “The 11 months of delay in paying troop allowances have demoralized our troops in Somalia,” said Defense Minister Emmanuel Ntahomvukiye. To calm people down, he said explanations have been given to prove that the Burundian government had nothing to do with all that. Burundi deploys military personnel as part of the AU peacekeeping mission to Somalia Amisom, since 23 December 2007. With more than 5,400 troops, it is the second largest Amisom contingent. For an average of USD 1028 per soldier and an 11 month delay, a total of more than 61 million dollars must return to the Burundian military. For a senior officer of Burundian army in Somalia, Burundi has fulfilled its contract terms. The Burundian contingent has been fighting against the terrorist group Shebbab, at the risk of their lives for more than 10 years. Burundian troops are highly valued for their bravery and dedication. “The African Union has to fulfill the terms of the agreement”. What does the memorandum say? Classified “top secret”, it is a memorandum of understanding between Burundi, as a contributing country of troops and resources and the African Union Mission in Somalia, Amisom. Through this agreement signed in 2007, Burundi pledged to send a contingent and the necessary resources to Somalia. The aim is to help stabilize the country and create republican institutions and offer a national rebuilding. For its part, the African Union is engaged in the management of troops on the ground, both at the operational level and in planning. It makes rotation plans. According to the protocol, the search for donors and financial management are guaranteed by the AU. It also takes care of the payment of allowances, medical care and compensation to the families of the victims. In case of a breach of the Memorandum of Understanding, the parties shall favor amicable settlement, arbitration and even recourse to the competent judicial bodies. 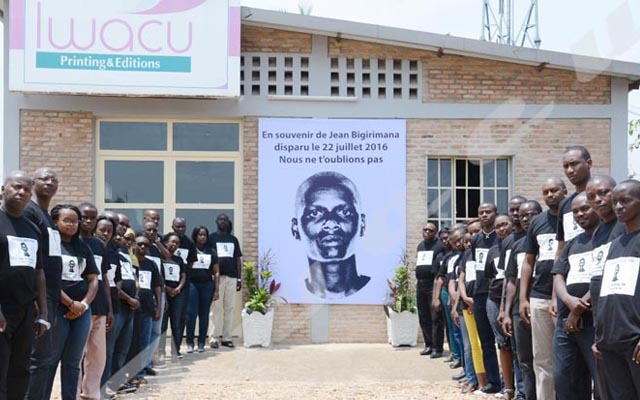 For Jacques Bitababaje, Lawyer and Expert in public international law, Burundi has the right to institute legal proceedings if the memorandum of understanding gives it the right. Except that in such contracts, which are generally the emanation of the United Nations, the settlement is privileged. Failing this, the matter goes to arbitration when one party does not honor these commitments. Burundi has a better interest in settling the case through the diplomatic channel rather than resorting to African courts. “We would save time and money”. According to the expert in public international law, if Burundi chooses to file a complaint against AU, it will never be compensated. Reaction of an Expert in International Relations. For him, the conflict is thus between Bujumbura and the Europeans on the non-respect of the Cotonou agreement. The President of the Republic should tackle the conflict between Burundi and the European Union because the African Union does not have the means to pay the Burundian military even if it wanted to. He concluded that the process of Bujumbura risks taking years and years without any result. Contacted, the liaison office of the African Union in Bujumbura said it was incompetent to react and sent us back to Addis Ababa. EU sanctions began in March 2016. The European organization, whose aid accounted for 20% of the budget, decided to freeze the direct aid granted to the government of Burundi. In October, the EU hardened its attitudes. It wanted to dry up one of the remaining sources of foreign exchange in the country. This is the European money used to pay the salaries of the Burundian soldiers engaged in Amisom. The European organization transferred funds to pay the balances of the African soldiers of Amisom to the accounts of the African Union at that time. A decision that has been taken on the sidelines of the United Nations General Assembly in New York. Brussels only paid the arrears covering a period up to 16 March 2016, the date on which the European Union imposed sanctions against Burundi, in accordance with Article 96 of the Cotonou Agreement. “We made it clear to the African Union that in the case of Burundi, we will reconsider how to channel this money,” said a source from the European Union. The objective is to find a way to pay directly the Burundian soldiers engaged in Somalia, without using Burundian government’s bank accounts. On 11 November, the African Union called on the European Union to reconsider its decision to directly pay Burundian soldiers deployed in Somalia. “We firmly reject the recent EU decision to differentiate the payment procedure of the Burundian contingent in peacekeeping mission in Somalia,” the AU said in a statement issued after a meeting in Addis Ababa. This meeting brought together, in particular, the Chiefs of Staff of troop-contributing countries to the AU mission in Somalia, Amisom. The European Union has always demanded that Bujumbura respect the Cotonou Agreement. The latter was signed by African states, including Burundi on the one hand, and the European Union on the other hand. It stipulates in Article 96 that the parties undertake to respect democratic principles, human rights and the rule of law. To this end, a delegation from the European Union assessed the situation in Burundi in October 2016. This assessment envisaged a possible resumption of direct aid to the government. At the end of the visit, the European Union considered that the essential elements contained in Article 9 of the Cotonou Agreement had not been respected by the Republic of Burundi. The head of the delegation said that “Burundi still has a lot of progress to make”. He called for inclusive dialogue with the opposition in exile. He also insisted on the respect for human rights, political freedoms and the media. Do African Union Governance Reviews Work?